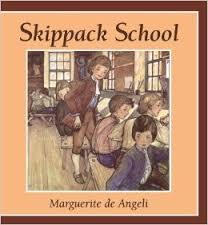 Skippack School is a 1939 historical fiction novella about a Pennsylvania Dutch boy named Eli. When Eli and his family arrive in Pennsylvania, Eli dreads going to school. When school begins, he is perplexed by Master Christopher (real historical figure Christopher Dock), who rarely hits the students, but still frequently disciplines Eli for acting out in the schoolhouse. Over time, though, Eli begins to mature and after being left alone for a day to care for his home and younger sister, and then making a special outing with Master Christopher, he realizes the importance of working diligently in order to reap the rewards he desires. This little slice of life story is a nice introduction to the way Mennonites lived in colonial America, and also a relatable story about a child who is anxious about school. For such a short book, it includes a lot of information about the Mennonite religion, language, and style of dress, as well as the founding of Pennsylvania and day-to-day life in the Pennsylvania Dutch community. It also teaches good character-building lessons about hard work, humility, and good behavior, and it introduces readers to a real historical figure in Christopher Dock, for whom today's Christopher Dock Mennonite High School is named. Like Sticks Across the Chimney, this book also includes some racially insensitive moments. The most egregious is a scene where an Indian named White Eagle states in broken English that it's fine with him that white men took his land. I am not someone who tries to apply 21st century understanding to old books, but this was really over the top and borderline comical. The Indian character speaks like Tarzan, and what he says doesn't ring true at all. There are a few other appearances by Indians as well, but none of these characters really have anything to do with the plot, and it's unclear exactly why they are included. I wouldn't just write off the book completely because of this - kids can learn something from these glimpses into outmoded prejudices - but I also wouldn't want to use this book to teach a child about Native Americans. All and all, I didn't think this was a great book, especially compared with others of de Angeli's titles, such as Bright April and The Door in the Wall, but it was a solid three-star story. It's not a book I need to own, but it has made me want to read some of de Angeli's other books, including Thee, Hannah!